My first introduction to CrossFit was at a fitness gym when a member told me that he thought I would should check out this place called CrossFit because I’m good at “jumping and stuff.” I was itching for a more challenging workout routine, so I dropped in for a Free Intro Class. I had completed my NASM Personal Training Certification and thought that Level One Classes would be a breeze, but it turned out there was a lot about weightlifting that I didn’t know. I CrossFit because… every workout is a growth opportunity. CrossFit has not only helped me feel confident, but strong, healthy, and safe as a member of an incredibly supportive community. I coach because… I know what it is like to face adversity. I know that the benefits of CrossFit can be applied across all domains in life. 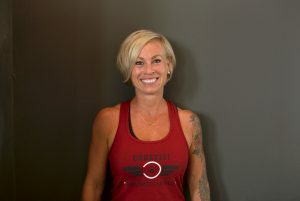 My career as a school social worker along with my personal training background, CrossFit Level One, and CrossFit Kids Certification help me be the most attentive, empathetic, and supportive coach that I can be. I love knowing that the children are developing the confidence, strength, and healthy lifestyles they need to feel like they can do anything.